The names of many figures of Greek mythology are used today away from their original context; one such example being Nemesis, a word relating to a Greek goddess, and now used to indicate a foe. Another example would be the word Arachnid, a word linked with spiders, but this name originates from the Greek word Arachne, which as well as meaning spider or spider’s web, was also the name given to a Lydian maiden. Arachne was the daughter of Idmon of Colophon; a city that would be encompassed into the region of Lydia, although it was constructed as an Ionian city. Idmon was involved in the fabric industry, for according to Ovid, he was a noted user of purple dye, one of the most valuable substances of the ancient world. This Idmon should not be confused with the more famous Idmon who sailed on the Argo. 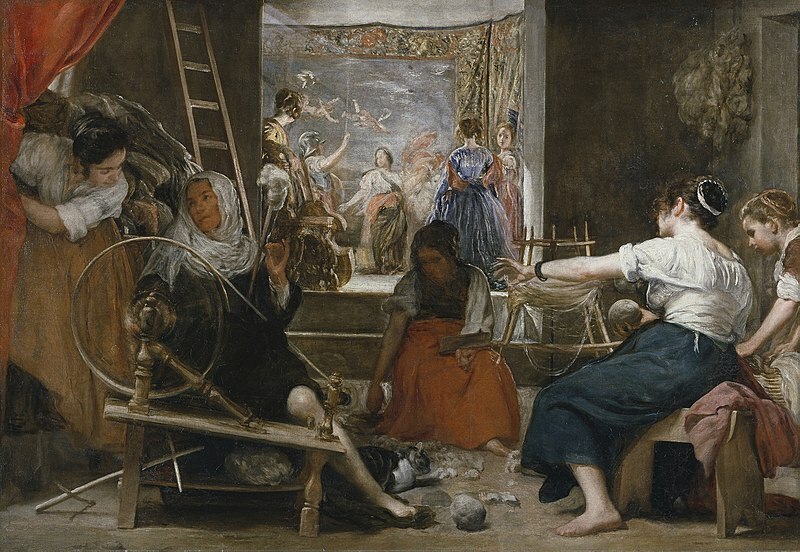 From an early age Arachne took up weaving, and with every passing year, her skill would increase, surpassing that of anyone in Lydia or Asia Minor. The fame of Arachne would spread across Lydia, and soon even the nymphs of Asia Minor were leaving their domains so that they could see the fabulous work that was being produced. These nymphs would seek to compliment Arachne for her skill, announcing that Arachne must have been trained by the goddess Athena herself. Now, most mortals would take this as a great accolade, but not Arachne, who responded with the comment that she was a better weaver than Athena. Such hubris seemed to be present in a number of Lydian women, for Niobe, of Lydian descent, would proclaim her superiority to Leto. When Athena heard of Arachne’s boast, the Greek goddess descended to Lydia to view the impious girl and her work. Initially, Athena disguised herself as an old woman, and whilst praising the work of Arachne, also sought to have the weaver acknowledge that her gift came from the gods. Again, Arachne declined to give proper praise to Athena, and even boasted that she could best the goddess in a weaving contest. No god or goddess of Mount Olympus would refuse such a challenge, and Athena shed her disguise, to reveal herself for who she was. Arachne was somewhat taken aback, but she would not display any humility nor ask for forgiveness, and so the contest began. The weave produced by Arachne and Athena were the finest ever made on earth, and the skill of both shone through as they weaved intricate patterns from hundreds of different coloured threads. Athena depicted the majesty of the gods of Mount Olympus, displaying them on thrones. Athena also showed the scene when she and Poseidon and competed for Athens. Arachne on the other hand also depicted the gods, but rather than depict scenes of the gods’ greatness, Arachne showcased the carnal actions of the gods, including the abduction of Europa by Zeus and also the god’s relationship with Danae. Now as to whether Arachne or Athena won depends on which version of the tale is told. Most would agree that no work of a mortal could best that of a god or goddess, but it was also commonly said that Athena, when examining the work of her rival, could find no fault in the work completed; but in the end, the outcome of the contest makes no difference to the end of the story. 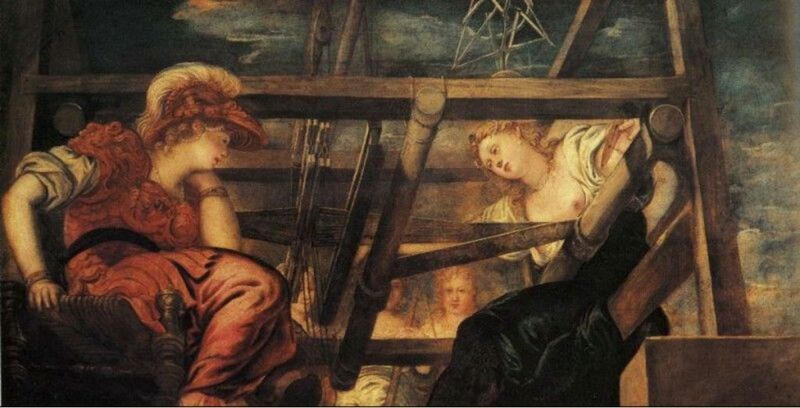 In the event that Arachne was declared winner of the contest, then Athena was so angered by the impiety of Arachne, and due to the subject matter of the cloth produced, that she ripped the work to pieces, and began to strike the girl with Arachne’s own tools. In despair Arachne hung herself from a rope. Alternatively, if Athena won the contest, then Arachne hung herself in despair at being bested. 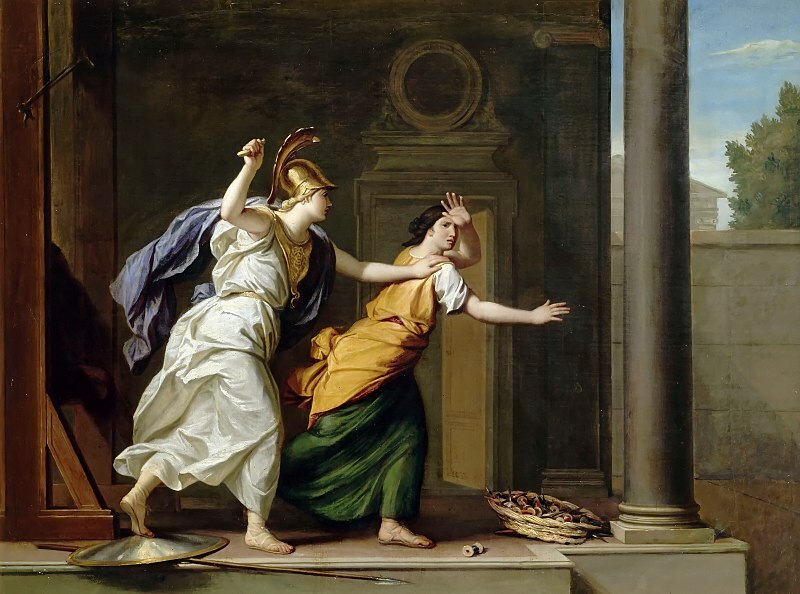 Athena though, did not let Arachne die, and instead loosened the rope around the girl’s neck, but this was not an act of kindness, for Athena had not forgiven Arachne, and thus, Athena sprinkled a potion manufactured by Hecate on to the girl. Immediately, Arachne started to be transformed, losing all the human features, until she was transformed into a spider. Arachne was destined therefore to be forever found at the end of a cord, weaving intricate patterns. Now Pliny would say that Arachne was a mother, giving birth to a son, Closter, by an unnamed father. Closter, was said by the Roman author to have invented the spindle, a vital component for manufacturing wool.